Good Business, Bad Quality: How NBC Is Both Right And Wrong On The Olympics There's a lot of chatter — a lot — about the things people don't like about the Olympics on television. But it's not hurting the ratings. Does that mean the griping is misplaced? Not necessarily. 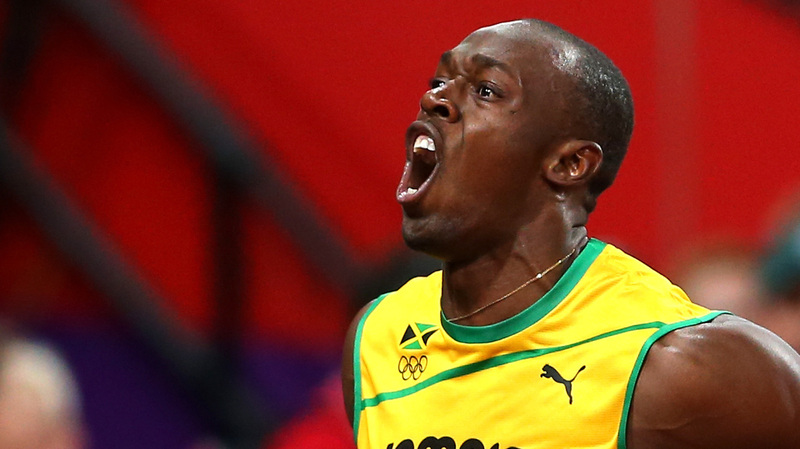 Usain Bolt of Jamaica celebrates winning gold in the Men's 100m Final yesterday. If you get your Olympics coverage on television, you didn't see it live. Point: "NBC's coverage of the Olympics stinks, because everything is tape-delayed and cut to shreds, and also the announcers are awful and they only care about American athletes, and by the time I get to watch anything, I already know what happened." Counterpoint: "People are watching in huge numbers." There have been some efforts to elaborate on just how thoroughly P and CP in this example are talking past each other; notably, Will Leitch, who wrote a very good piece last week making a lot of solid points about how most people aren't on Twitter, so the existence of Twitter frustrations isn't a good business reason to change the coverage when most people are watching it on television and — presumably because the ratings are high — they're all happy. But there are a few flaws in Leitch's argument, I think, particularly because I sense in it the logical fallacy that if you're hearing the annoyance mostly on Twitter and most people aren't on Twitter, that means most people aren't annoyed and don't care about the tape delay. In fact, just as every angry letter to a public official represents the views of many who don't write letters, the people griping on Twitter undoubtedly are joined in their frustrations by countless people who are not on Twitter, and I'm sure plenty of evening-show watchers would rather see more stuff live — and more actual sports, and fewer fawning profiles, and less obsessive focus on American athletes, and important events not kicked to the 11:30-midnight slot (!) and all the other things that have been grouped under the general heading of complaining about the way NBC has been covering London. And they likely feel that way whether they're into social networking or not. It's not as if the people on Twitter aren't also watching the evening broadcasts; you can see them watching and hating the coverage every night in real time. It's some of the same people. That's obviously not to say Twitter is representative of the entire population; far from it. But when it comes to complaining about this stuff, it may not be the tip, but it's probably not the whole iceberg, either. I'm also not sure there's quite as much of a disconnect between serving the angry-Twitter-real-time people and serving the evening-TV audience as some others do. Nobody is suggesting they can't produce the tape-delayed evening show for people who want it; the question is more whether it would be nice to also have the option of watching high-profile events like Usain Bolt's races or the gymnastics finals when they're live. There's space on cable, after all. The entirely fair point isn't really that not enough people are annoyed, since lots of people are annoyed. It's that not enough annoyed people are annoyed enough — specifically, they aren't annoyed enough not to watch, and unless they are, there's no business reason to care about their satisfaction. And if we're arguing about profits and how to make them, that's the right analysis. Ultimately, though, we are still talking right past each other, because "good business" is not an answer to "bad quality" any more than "bad business" is an answer to "good quality." Sometimes severely compromised quality is good business — that seems to be the case here, where however frustrated people are, it's not keeping them from tuning in and giving NBC huge ratings, so from a purely business perspective, why change anything? That's true, and yet I bristle at the idea that this is the one truly savvy position to hold, as is implied when Leitch — a bit patronizingly, I think — asks whether those dissatisfied with the coverage understand that NBC is in business to make money. The idea that complaining about coverage choices is wrongheaded because those choices work with the existing business model is absolutely accurate if you are an investor or a business analyst, and it's an entirely appropriate part of your analysis if you work for NBC. But it's wholly unsatisfying if you are a viewer or a critic and you could honestly give a sparkly purple leotard whether NBC is making money or not, because you are there to discuss whether the coverage is good or bad, not whether it is profit-drawing. It's one thing to suggest that business strategists should care only about the bottom line and the business plan when being critical; it's quite another to suggest that everyone should. People aren't tweeting "#NBCFail" to mean "NBC [is failing to make any money]," or they'd have knocked it off after the huge ratings for the opening ceremonies. In my experience, when critics savage Two And A Half Men, no one eye-rolls that CBS is in business to make money. When the Emmys nominate mostly little-seen series as the best of television, no one says they should be considered failed projects because they don't really align with the business plan. There are multiple ways to fail and multiple ways to succeed, and when audiences complain about the coverage they're getting, it's not usually because they think it won't enrich the company. Of course, both critics and viewers sometimes wander into a minefield by couching their creative/critical dissatisfaction in business-strategy terms when they don't necessarily know what they're talking about. It wouldn't be hard to dig up criticism of NBC's London coverage that suggested it would surely lose them viewers and therefore profits, which it hasn't. When you're evaluating quality, it's smart not to tell people that you could do their jobs better than they do when their jobs go well beyond evaluating quality. As in all things, it's good to stick with what you know. On the flip side, NBC has stumbled when it tries to defend these business decisions as creative ones, as with the claim that the opening ceremonies couldn't be shown live because we needed their commentators to explain them to us. The element missing from the discussion is that the Olympics are among the only sports broadcasts reviewed by regular TV-beat critics and by viewers not only as good television or not, but as good stewardship or not. The Olympics are a massive, worldwide event that a lot of people love, and NBC is the only broadcaster that can bring it to American television. When you know that a race's results have already hit other people's newspapers, but you haven't even seen it yet, what you experience is not just the disappointment of a fan spoiled about Breaking Bad. It's the sense that you have been deprived of participation in something big that you could have shared with a lot of people in a lot of countries. That was particularly true with regard to the opening ceremonies and the Parade of Nations. There may not be good hard-headed business sense in wishing we'd been able to watch all of that live, but for a lot of people, there is simple common sense. Whether it's naïve or not, a lot of fans of the Olympics believe that broadcasting the Games is — at some level, in some part, with however many caveats you might want to apply — a public trust. That doesn't mean they don't understand that NBC is in business to make money. Everyone who watches the Olympics knows that NBC is in business to make money. If you miss it, they show you some more promos for the fall season. Everybody understands that it's a money/ratings game. There are certainly those who say NBC is missing the changes in media that will one day make this kind of broadcasting untenable — I said so myself more than two years ago during the Vancouver Olympics, when the delay situation was nowhere near as dire as it's been this summer. It's possible to understand that it's not necessary to change now in order to continue making money and yet still think that somebody had better start planning for what this will look like in the future, because it's not going to look like this. In fact, you can see the coverage experimentation that might one day lead to a different model. There have been technical problems and access problems with the live streams of the Olympics, but the live streams themselves have often been wonderful viewing. I've become particularly smitten with "Gold Zone," the live stream that moves from event to event, getting all the big stuff as it's happening live and also sampling from lots of sports. It's allowed me to watch a bunch of stuff I otherwise would not have seen — judo, table tennis, badminton, whitewater canoe, trap shooting, archery. It has a Twitter feed that runs alongside it that's as spry, minimalist, informative and curious as the evening broadcasts are somehow simultaneously empty and bombastic. All the griping that's taken to be so naïve is what's going to continue to drive that experimentation with streaming. And eventually, they will improve the technology so it works better, and they'll come up with a solution for cord-cutters, and they'll probably make it available on set-top boxes like Apple TV and Roku. How can they not? What other direction is there to go? What direction is the rest of television going? The more of the Games I've watched this year during the day when they're live, the more I've come to see the evening broadcast as a kind of highlights show. And there's nothing wrong with a highlights show. But surely, it's okay to critique a highlights show for having too many James Bond segments and not enough actual sports. Surely, it's okay to believe NBC is failing, not as a business, but creatively and — more fundamentally — with regard to that thread of public trust? As long as there are stadium-sized bags of money rolling in (or at least more money than they feel they'd make with other models), nobody can really claim that NBC is not doing right by its shareholders. But that doesn't close the question of whether it's doing right by its viewers. To the complainers who helped push us toward the live streams, I thank you. Resume bellyaching.